Top ten Bees and win for Forest doom Blackburn. A third season in the Championship. A third top ten finish for Brentford. Despite a 3-1 defeat to Blackburn Rovers, the ubiquitous ‘other results’ conspired to send the visitors down to League One and ensure the Bees continued their proud ascendency. Whilst Birmingham City boss Harry Redknapp suffered a very squeaky bum and Mark Warburton at Nottingham Forest endured a short term scare, both managers recording wins meant that the three points and two goal victory margin were ultimately insufficient for Blackburn. We’ll keep this brief, for now. Besides, what else can you say? Not much. It seems trite to revel in another team’s moment of misery. Rovers fully deserved their win and came so, so close to securing Championship survival. Brentford were very much observers in a first half that saw an early two goal lead given away and an improbable tale of survival almost unfold at Griffin Park. Alas, it was not to be. As Nottingham Forest started to find the net in their own fixture up at the City Ground, so did Brentford. Lasse Vibe all but scuppering Blackburn’s slender survival hopes when he got on the end of a low cross from Harlee Dean, of all people. The captain finding himself in uncharacteristic territory out on the right but still able to deliver a killer ball into the box. That was as good as it got. Rather than press home the psychological advantage, Brentford were unable to penetrate. Indeed, Harlee was the man still involved in the action, although not for any reasons he’ll care to remember. I’m sure by now we’ve all seen the picture of him and Craig Conway engaged in what official would describe with the somewhat diplomatic phrase: ‘ the two debated the decision at close proximity’. This was sufficient to earn a yellow card and was followed up shortly afterwards with a second for a foul in the box. Red card and penalty were the obligatory next steps. 3-1 and effectively game over. Indeed, that’s where the scoring stopped and the game ended as Blackburn then had to endure ‘trial by TV’, waiting to see if Bristol City could equalise against Birmingham at the death. They couldn’t. What else can we take from today? Well, it was a fond farewell for Alan McCormack whose decision to move on at the end of the season is one which has been made very public these last few weeks. The programme contained fitting tribute whilst the player himself made a gladiatorial entry to this footballing arena. His name ringing around three sides of a packed Griffin Park. Sam Saunders was inducted into the Brentford Hall of Fame at half-time whilst even ex-Bee Sam Wood was in attendance. He, along with Maxime Colin, amongst those enjoying the sunshine on the forecourt at half time. We’ll round up the season properly over the next few days. For now, there’s the Player of the year evening to prepare for and a few more celebrations so we’ll cut this one dead here. Although, in true Columbo style, there is just one more thing. Seeing Harlee’s flesh pressed up so close to another player did make me recall that this isn’t the first time we’ve been here. Whilst perhaps not in such close proximity, who could forget that cheeky gatecrashing of Chris Wickham’s interview with then captain Kevin O’Connor ? A shock u-turn. But have the bookies got it wrong for the Villa game? Back in early August, the former Bee (his other clubs including Bristol Rovers and, of course, the Loftus Road mob) incensed Brentford supporters with his pre-season prediction that we would go down. Writing under the moniker of ‘football expert’ in his column for Sky Sports , he called us out to finish in 22nd place, noting: “Brentford are regressing. Mark Warburton got them punching above their weight. They still haven’t replaced Andre Gray and Alan Judge will be missing for the start of the season. They could be in trouble”. Whilst Newcastle United v Sunderland could well be one of the big derbies in next season’s Championship (unlikely though it seems look at the table – it doesn’t lie), 2015/16 draws to a close with what is one of the most hotly contested local rivalries that our division currently has to offer. It’s only Brentford v Fulham ! Our final game of the campaign at Griffin Park sees a visit from a Fulham side who have only picked up 1 point out of a possible 9 against Brentford since our paths have crossed once more. And even that was only thanks to a wayward linesman denying Jota a late winner that was subsequently proven to have been onside when we played away in December. The Bees have found the back of the net 8 times in those three games and so couldn’t have picked a better time to welcome back Lasse Vibe and Scott Hogan. This, after the pair were both rested for the trip to Hull City (move along, nothing to see here) in midweek. Indeed, at one point it seems as though this might even have been the ultimate survival battle for both teams. However, a resurgent Brentford have stormed up to 10th whilst ongoing ineptitude from MK Dons, Charlton and Bolton mean that Fulham have had the hard work done for them. Regardless, it still promises to be a more than spicy encounter. Derby games always are and the Cottagers will not doubt be finally hoping to get one over us. Make no mistake though, Dean Smith will know exactly what this means in TW8 and will be looking to sign off in front of the home fans with nothing but three points. On a personal note, it’s the final ‘kit obsessive’ article of the season in the match day programme. The feature won’t be back next campaign for the simple reason that we’ve already ‘done’ most of our opponents. That’s not to say there won’t be a few one off specials on those newcomers to the Championship. Without wanting to give too much away about tomorrow’s feature, I did stumble across something interesting whilst looking into the Fulham back catalogue. Were those black collars and white shirt the unlikely inspiration for John Travolta, whose ’Saturday Night Fever’ came out just after the Cottagers had reached the 1975 FA Cup final…. The other reason to mention Newcastle United and Sunderland at the top of the article was, specifically, because FourFourTwo magazine are currently running an online article featuring the 50 biggest derbies in world football. This North-East rivalry is included although, with only the top ten to go and London already featured with Arsenal v Tottenham, there is no sign of the Bees. Yet. Could we still feature? Having already gone through some huge names I’d suggest it unlikely, although I still live in hope. Still, if that’s a disappointment , one other positive is that the part on Southampton v Portsmouth (which ranked higher than both the Tottenham and Newcastle encounters) does not include a picture of John Westwood. It’s wonderful that they’ve not bowed to the almost contractual obligation of having to accompany any feature on the South Coast club with a picture of the fright wig, stove pipe hat, engraved teeth and bell of self-appointed ‘Mr Portsmouth’. I’m sure he’s a ‘character’ but he’s one I’ve no desire to see, hear or smell any more of than we’ve already been exposed to over the years. And finally, it’s our last look at Kitman Bob and his BBGiveaway. Who knows what he’s going to test us with tomorrow but with a huge roll over prize on offer, including the incredible one-of-a-kind signed shirt, I can only hope it is something special. Keep an eye on his Twitter feed today and tomorrow to find out. I’ve said it before and I’ll say it again – Bob has been an absolute legend this season and such a credit to Brentford football club. Thanks, Bob ! I can’t wait to see what you have up your sleeve…. Bye Bye MK Dons. Brentford racked up yet another win and another hatful of goals on Saturday afternoon to confirm that Karl Robinson and his team will be making an immediate return to League One. There was also that Doctor Who moment during the Manchester United – Everton FA Cup semi which we’d worried about yesterday whilst Kitman Bob is at it again. Yet again. First up though, Stadium MK. As is the norm the BBC, Beesotted, official site or other less salubrious pages are the place for proper match reports. Instead, the headline news to trumpet about has to be about a 4-1 win for the Bees. It was a game that, not for the first time this season, featured brilliant goals from first Sergi Canos and later Ryan Woods (do check these beauties out on the Bees Player highlights package). These sandwiched Lasse Vibe’s 13th of the season before Jake Bidwell rounded things off. His free kick from the touchline, just like the game at Preston, drifting past everybody and into the back of the net. Mark Burridge is back for another win. What jinx? Maxime Colin reclaimed his right back position although Josh Clarke, who had impressed midweek, did get the final half hour. John Swift, gash healed, was an unused substitute. Only just over a month ago many of, us including our own head coach, had noted that the Bees were in a relegation scrap.Now its been 16 points out of 18 over April. It is a month that has seen 16 goals and five wins out of those 6 games. As it stands we’ve hit Dean Smith’s tenth spot target and could even end as high as eighth should the winning run continue. Victory in ‘our game in hand’ at Hull City AFC on Tuesday night will see the Bees just one point behind Ipswich Town in 8th and make the ‘manager of the month’ vote a very interesting one indeed. I’d still say that one is a straight shoot out between Chris Hughton or Aitor Karanka. Their teams have won as many as the Bees this month whilst keeping up the pace at the top of a table that sees the top three all on 87 points with just two games to go. Now that’s pressure ! As a side note, am I alone in having a ‘spellcheck’ that defaults the Middlesbrough manager’s name to Aitor Karaoke ? Now there’s some wonderful imagery. Here’s hoping for a Phil Brown style pitch side singalong as Boro’ go up and fairly leave us in peace after 6 wins out of 6 over the last two seasons. Could Chris lift something more valuable? The other Championship news of excitement saw QPR held by Reading. It means the Bees are two points clear of the Loftus Road mob in the battle to see who will end the season as not just West but all London’s top league club. That Hull game has even more riding on it than our opponents might realise. Back to the FA Cup. We talked yesterday about the forthcoming Doctor Who ‘reveal’ that the BBC had intended to make during half time of the semi final and, sure enough, it happened. Whilst I’ll leave Bees supporter @Lokster71 to comment on the choice of ‘assistant’ via his excellent ‘Patient Centurion’ blog, I have to say that Gary Lineker handled the obvious disruption well. Indeed, the BBC anchor giving a quite marvellous post-reveal segue pitch side as he dead panned, “The doctor’s not the only one with a new companion, Dan Walker talks to Lee Martin…”. The only sour notes to the afternoon were Manchester United securing a winner at the death. To be fair, I’d have been just as unhappy had Everton done this. It meant that with the spectre of an additional thirty minutes ‘extra time’ now removed, along with it went the chance of Mrs Browns Boys (presumably the safety net should such a situation have arisen) being pulled from the evening’s schedule. Worse, it meant we got Michael McIntyre sooner. Whilst Lineker scored bonus points for the Dan Walker gag, I did also think his closing “Young Prince / party like its 1999” outro felt a little bit forced and, dare I say it, cashing in on the week’s sad news. As ever, the place to look is on Bob’s twitter account. Here’s hoping Sam Saunders is back in the team or my bet is spannered . As Brentford fans wait for the managerial void to be filled (May 30th being Mark Warburton’s last day in that role) there was plenty going on elsewhere yesterday as Southend United and Charlton Athletic did their best to alienate league rivals and supporters respectively. Meanwhile, the rumour mill was linking Everton and Brentford, again, although this time with a player moving away from Griffin Park. First up though, social media. I’ve long had a sense of nervous trepidation when clubs use their official ‘twitter’ accounts for (alleged) comedy purposes or ‘getting down with the kidz’. At best it falls flat on it’s face in a cringeworthy mess; at worst it is nothing more than bullying. Very few get it right. I’ll spare you another lecture on #trophyfriends – our own efforts in this field are legion (whether through the official club account or employees stating their opinions regarding the team). That said, Mark Warburton and (especially) Matthew Benham seem the exception to this rule with the latter providing a number of genuinely amusing moments over the season and his use of cryptic video clues to reveal transfer news. Matthew Benham – genius and winner of Twitter. 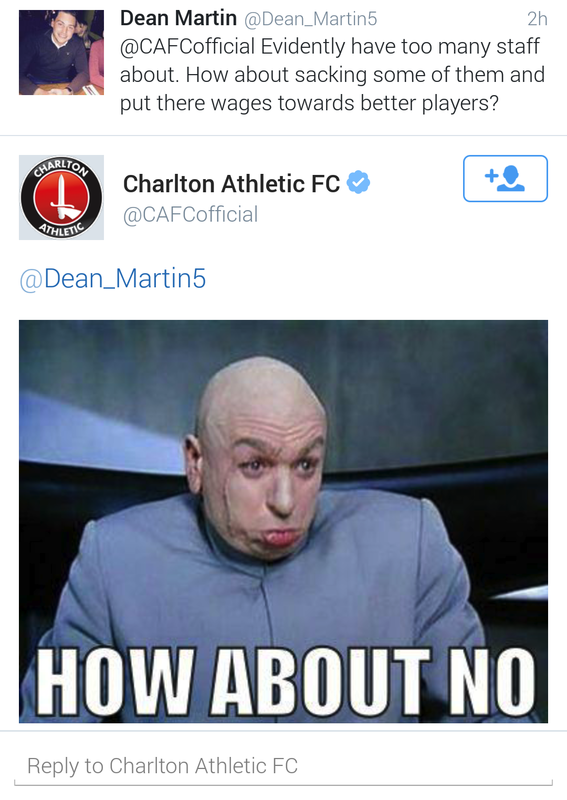 Then Charlton Athletic came along and seemed to buck the ‘official trend’ . Their comment when all at the Goldsands were celebrating a promotion for Bournemouth stopped the football world dead in its tracks and made us all think….what if? This, from the club that had earlier released the security camera footage of a couple ‘scoring’ on the centre spot after breaking into The Valley (not a euphemism) – later revealed to be a stunt to promote pitch hire. Then yesterday it all came crashing down. Seemingly, the club have taken exception to one of their supporters having the temerity to suggest they invest more on the pitch than off it. Putting aside his grammatical faux pas (‘there’ rather than ‘their’ ranks alongside ‘expresso’ as typos to infuriate) was there any other reason to respond in such cutting fashion? Moreso, via that most heinous of social media weapons – a meme (surely something which should be outlawed by the Geneva convention)? Putting down their own fans – via meme…. 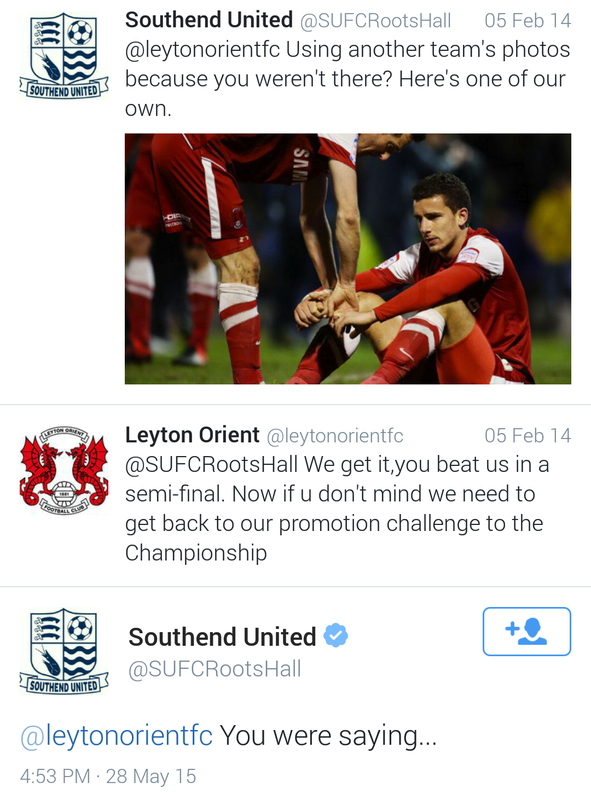 But if this act of humiliating/bullying (delete as applicable) a supporter in front of thousands was bad enough, Southend United went one better (or should that be worse?) in regards to Leyton Orient. As for Brentford and Everton, several news sources were suggesting the Goodison Park team are showing an interest in England U-20 star, Moses Odubajo. Hopefully, this is just one of the numerous rumours floating around cyberspace that we will be deluged with as the papers desperately look for something to talk about over the summer months. Moses has made a fantastic step up from League One to the Championship; moreso, as somebody who started as a winger and had to be shifted to right back after injury to Alan McCormack – a position he went on to occupy for the rest of the season. Mind you, it shows how well we have done even for it to be suggested that Everton are looking at a player form the Brentford first team, rather than us raiding their youth system as has happened so many times in the last few seasons. And finally, in the latest updated from the FIFA scandal, Sepp Blatter released another statement saying that he was totally unaware of any wrongdoing and couldn’t possibly be expected to police FIFA. Or, rather, football as he conveniently removed as much reference to his own, allegedly, corrupt organisation as was possible. Any excuse to crowbar The Simpsons into this blog. The amalgamated Last Word season compendium: Tales from the football village (from Saunders territory to unchartered ground), is now available to download onto Kindle (and other electronic reading device) in full. Running from July 2014 – May 2015 it contains some additional material and is available for less than the cost of a Griffin Park matchday programme. Including all the info on our own social media highs and lows, along with a full review of the season just gone, it’s the e-book that nobody is talking about – but that you might well enjoy. Thank you Manchester City. What more can you say after they condemned Queens Park Rangers to an immediate return to the Championship on Sunday lunchtime? And how! We’ll get to the latest from Brentford shortly (where ‘official twitter’ is at it again) but we can only start with events at the Ethiad as City confirmed that the first of next season’s West London derbies will be an all Championship affair between Fulham and QPR after City beat the Loftus Road outfit 6-0.